The FREYA Magwell from Raven Concealment Systems allows rapid reloading of semi-automatic handguns, saving valuable time in fast-moving tactical situations. 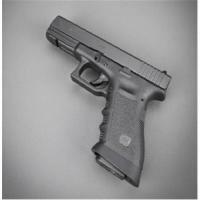 It fits full-size Glock 17, 22, 34 and 35 pistols, as well as Glock 19, 23 and 32 models from Generations 3 and 4. In addition to flat factory baseplates, it is compatible with Glock +2 baseplates, Arredondo +2 and +5 extensions, Magpul Speedplates and Dawson Precision's extended tool-less magazine extensions and EZ-Off baseplates. However, it will not work with 10-round restricted magazines, or with any Gen 4 backstraps. The Magwell installs easily without any permanent modification to pistols. Adds minimal bulk, fit is perfect (G17 Gen 3), makes mag change.. well, not actually faster but less prone to ups. Fulfilled my expectations 100.